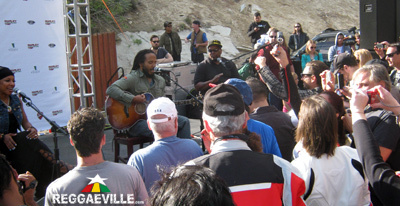 Leave it to Ziggy Marley to make promoting a film in Los Angeles a day of motorcycles and music. 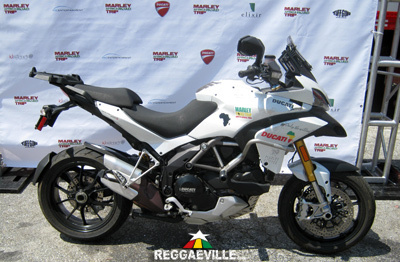 To announce the DVD release of his six-part docu series, Marley Africa Road Trip, the reggae icon, brother Robbie, and director David Alexanian mounted a trio of Ducati Mutistrada 1200s and rode 25 miles through the twists and turns of the Angeles Crest Highway to Newcomb’s Ranch, an Angeles National Forest roadhouse some 5,300 feet above sea level. To an audience of nearly one hundred fellow bikers, Marley and his trio of band mates performed a 30-minute acoustic set of favorites new and old. Speaking a few minutes prior to the mountain trek, an enthused Marley recalled the joy of his first adventure biking, a 2010 trip to South Africa with siblings Robbie and Rohan coinciding with the World Cup soccer tournament that served as content for the DVD series. Inspired by the idea of African unity, Marley said he was anxious to return to the continent. Though ultimately an incredible experience, the singer was surprised if not slightly disappointed by what he found musically. “I was hoping to hear some indigenous music,” Marley offered. “Instead the kids, they were listening to American pop.” Nevertheless, Marley did hint at some songwriting efforts on the trip, as well as singing around the campfire. On this afternoon there was no shortage of inspiration, with proceeds of the event benefiting The Chepstowe Basic School, located in an economically challenged parish of Port Antonio, Jamaica, as well as Life Rolls On, a charity providing support for those young people affected by spinal cord injury. Surrounded by sun-kissed pine trees, Marley and his assembled musicians - guitarist Takeshi Akimoto, singer Tracy Hazzard, and percussionist Rock Deadrick - launched the program with Bob Marley’s Africa Unite. Marley, mentioning that the day’s ride was his first through these winding California mountains, and as a result felt as though he’d joined a new family, segued into Family Time. Again referencing the slightly harrowing moments on his journey to the Ranch, he reassured himself and the audience that, “every little thing was going to be alright,” before delving into Three Little Birds. A slower Love is My Religion followed with Marley thanking all those for attending. The closing Could You Be Loved wrapped up a taut, emotionally charged half-hour concert that saw Ziggy clearly running on the adrenaline of the ride.